Kimchi is a naturally fermented pickle that has become emblematic of Korean food. Hundreds of variations combine different vegetables, spices, and techniques to achieve a wide range of pungent and delicious effects. 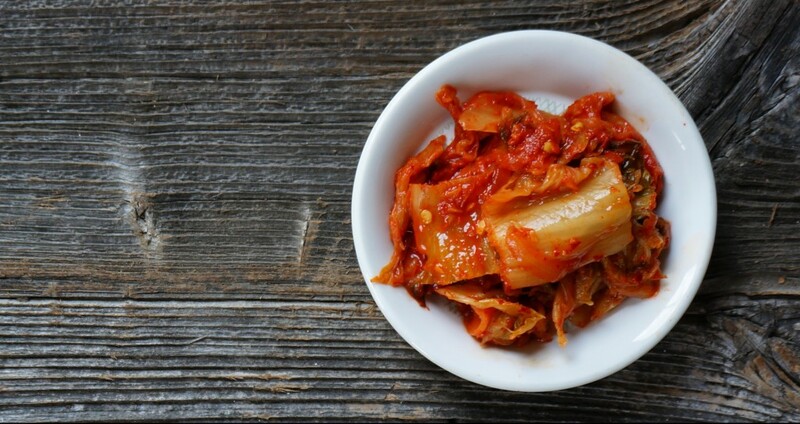 Numerous studies on the microbiology of kimchi have identified three major genera of lactic acid bacteria—Leuconostocs, Lactobacilli, and Weissella—that dominate the finished product. The progress of any individual fermentation depends on environmental factors, such as the temperature, acidity, oxygen level of the mixture, and nutrients present, to name a few. While many non-scientific sources allude to the use of hot spices to control microbial activity in foods, very few studies have been done on the extent of this effect and how the presence of hot pepper impacts the fermentation process when all other factors are held constant. A recent paper in the International Journal of Food Microbiology asked a simple question: how does hot red pepper influence the fermentation of kimchi? 1) pH and total cell count were measured. 2) The composition of the communities in each kimchi sample (at the genus level) was assessed using a high-throughput technique known as pyrosequencing. Comparing these results over time and between samples gave a glimpse into what fermentation microbes dominated at different periods of time as the fermentations progressed. 3) A technique called 1H NMR spectroscopy was used at each point to measure the concentration of both fermentation fuel (the sugars provided by the vegetables as they broke down) and selected flavourful fermentation products, including lactate, acetate, and mannitol. This provided a third way of tracking the progress of the fermentations and looking for differences between the samples. The teams verified that all of the kimchis behaved similarly to those in previous studies, with a wide diversity of bacteria present at the beginning of the process, followed by a dominance of three main genera (Leuconostoc, Lactobacillus, and Weissella) as fermentation progressed. The biggest differences between the peppery and pepperless kimchis was that the bacterial diversity of the community decreased more slowly over the course of the fermentation when pepper was present, and that in both kimchis with pepper, Weissella was significantly more prevalent in the finished product. While the successions occurred along similar paths in all the kimchis, pepper decreased the speed of the early stages of fermentation in both cabbage and radish kimchis. Once the early phase was complete, however, the pH decreased at a similar rate, leading them to conclude that pepper did not affect the speed of the middle or late stages of fermentation. The comparison of the fermentation precursor and by-product levels showed that the finished kimchis did not differ significantly from one another; as far as the five major compounds measured were concerned, all the kimchis ended up in the same place. However, the consumption and production rates of the compounds differed in the early stages depending on the addition of pepper; once again establishing that peppery kimchis ferment more slowly in the early stages. While the paper showed that pepper has an effect on the microbial communities, we do not yet know what the mechanisms are that cause these effects: are they direct (bacteria responding to a compound in the pepper) or indirect (pepper buffering the pH of the mixture in a way that gives Weissella a competitive advantage, for example)? It would also be interesting to know how the kimchis with and without pepper differed from a flavour perspective (beyond spicyness, of course). The authors looked at the amount of five flavourful compounds and found no significant differences between the kimchis at the end of fermentation, but those five compounds aren’t the only ones that a person would taste, as a wide variety of metabolites (including carbon dioxide, ethanol, and organic acids present at lower levels) also contribute to kimchi flavor. As the proportion of Weissella was so much greater in the pepper-containing kimchis, were other potentially Weissella-specific metabolites or flavours present? Or less of the Leuconostoc or Lactobacillus related metabolites? These differences could have a big impact on the taste of the kimchi that the methods used in this paper would not detect. Kimchi’s reliance on native microbes for its fermentation has been identified as a roadblock to effective industrialization of the process, and several studies—including this one—have identified better-standardized industrial kimchi as the ultimate goal of their research. As the power of these microbial communities to tend themselves when presented with the proper conditions is so striking, it would be useful to better understand the variation that industrial producers are experiencing, and to see whether their problems could be better dealt with through an environmental approach rather than inoculation. Jeong et al. (2013) Effects of red pepper powder on microbial communities and metabolites during kimchi fermentation. Int J Food Microbio 160: 252-259. Jung et al. (2014) Kimchi microflora: history, current status, and perspectives for industrial kimchi production. Appl Microbiol Biotechnol. DOI 10.1007/s00253-014-5513-1. Experimental designs without replicated treatments are not useful. Thanks for your comment on this article. Can you explain why you think this study didn’t use adequate replication? How would you have done the experiment differently? You’re wondering where the other species of probiotics, enzymes are coming from? Kimchi fermentation requires an additional fish sauce that contains an enzymes itself that is actually capable of healing.